Field trips will be posted as they are arranged. Please check back. Join us for a visit to UBC’s own Museum of Anthropology. The museum is renowned for its displays of world arts and cultures, in particular Indigenous works. As well as being a major tourist destination, MOA is a research and teaching museum, where UBC courses in art, anthropology, archaeology, conservation, and museum studies are given. MOA houses 38,000 ethnographic objects, as well as 535,000 archaeological objects in its building alone. On this night we will join a public tour of their newest exhibit, Fabric of Our Land, by the curator Sue Rowley. The exhibit features early Salish weavings on loan from institutions in Europe and the United States, and the tour will look at this history of these weavings and how they ended up so far from home. Afterwards you are welcome to take a self-tour through the vast museum and its collections. If you are planning on attending, please bring your UBC student card, as it allows you free admission. If you do not have one, we will cover the entrance fee. The Nikkei Centre exhibits and provides vibrant programs about Japanese Canadian history, arts and culture. Join us for a guided tour of their current showcases, followed by a public artists’ talk on their special exhibit– BETA VULGARIS The Sugar Beet Projects. In this exhibit, the museum gallery will be transformed into a Japanese dry garden, punctuated by large sculptural ‘boulders’ made of molten, burnt, and sculpted sugar. A wooden boardwalk will traverse overtop of this landscape. It explores the relationship between the seemingly innocuous material of sugar and Japanese Canadian history in Western Canada. Admission is free, just show up on the day! Join us for a self-guided tour of MOV’s temporary and permanent exhibitions. City on Edge: A Century of Vancouver Activism is a visually stunning photo-based exhibition exploring how protest demonstrations have shaped Vancouver’s identity. The exhibit depicts moments when the city stood up, took to the streets and rallied for change and is a unique opportunity to access rarely seen images capturing epic moments of Vancouver’s protest history. c̓əsnaʔəm, an important ancestral village of the Musqueum First Nation, invites viewers to think about who’s home is Vancouver? How have newcomers claimed Vancouver as their own? How do the Musqueam understand their lengthy connection to this place? On show in MOV’s permanent exhibits are iconic objects that represent Vancouver’s changing culture from the 1920’s to 1970’s, including an exhibit focused on the history of the infamous neon lights that illuminated the cityscape. For fifteen years, Vancouver-based artist Carol Sawyer has been conducting research and making artworks that enrich and expand the Natalie Brettschneider Archive. Carol Sawyer: The Natalie Brettschneider Archive presents the latest findings of this ongoing research project that deftly reconstructs the life and work of the genre-defying, fictional artist Natalie Brettschneider. Beginning with her childhood in New Westminster, through her travels in Canada and Europe and her eventual return to British Columbia, real people, places and events are woven throughout Brettschneider’s story. The photographs, letters, paintings, films and other materials on view connect Natalie Brettschneider to a rich community of interdisciplinary women artists working in Europe and British Columbia from the 1920s to the 1970s. The practices of these artists were often under-represented in institutional collections and largely excluded from historical accounts of modernist art history in this region. By using a fictional character to draw attention to the work of these artists, Sawyer opens this period up to a reconsideration of the diverse practices, subjects and actors that shaped the course of mid-century modernism in this region and in many ways set the stage for the interdisciplinary practices of the 1960s and 70s. 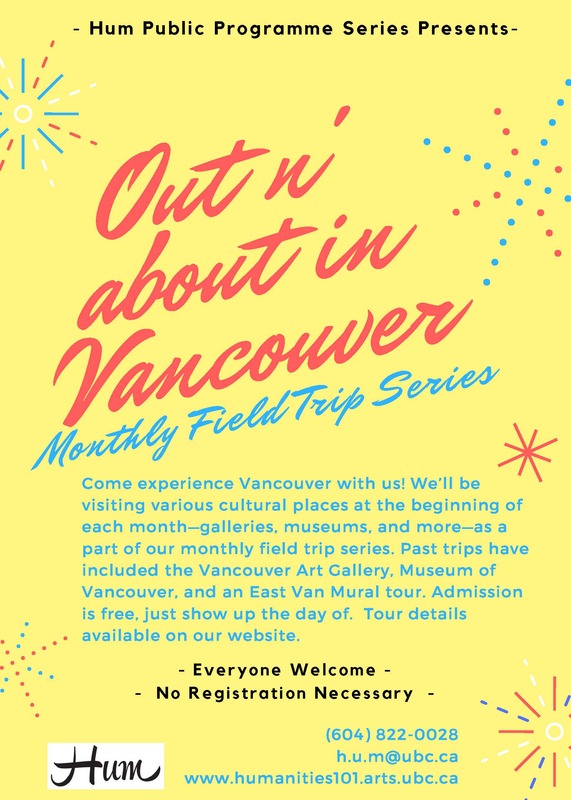 In association with the Vancouver Mural Festival, we are excited to announce the first installation of our Monthly Field Trip series for this year: The Mount Pleasant Mural Tour! We will be walking around and seeing some site-specific murals that went up as part of this year’s Mural festival. Our guide will talk about the artists’ vision, medium and creative process. The tour will last approximately 90 minutes.